Research in the Knowles group focuses on studying the fundamental optical, electronic, and chemical properties of transition metal oxide nanocrystals and thin films. The inexpensive and nontoxic composition of these materials, their ability to absorb sunlight, and their stability to electrochemical degradation make them ideal candidates for applications in solar energy conversion and energy storage technologies. “Prof. 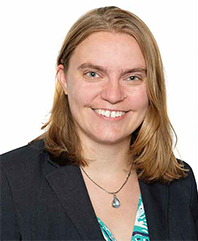 Knowles is leveraging her expertise in colloidal semiconductor nanocrystals to build a creative, interdisciplinary research program centered in materials chemistry,” says Todd Krauss, professor and chair of chemistry. Knowles “is a superb junior faculty member who is on track to become a prominent researcher in materials chemistry, and who has already made a significant positive impact on our department.” Learn more about the Knowles Lab here. Poletti studies the “finely orchestrated interplay between sensory processing, the control of motor behavior, and the allocation of attentional resources” in enabling visual perception, with a particular interest in fine spatial vision processes in the foveola. This is a small high-acuity region of the retina that humans use to inspect objects of interest. Foveal vision is fundamental for normal functioning, yet surprisingly little is known about its mechanisms.